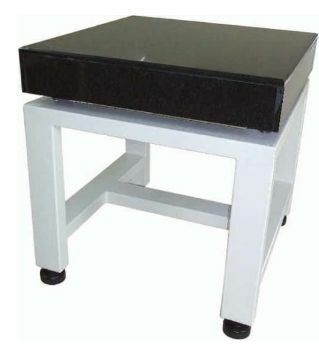 Anti-Vibration Top - 100% Anti-Vibration area will be provided Well polished black color Granite laminated over thick heavy kadapa slab. Between 1" Height anti vibration rubber pad. MOC - Made of 18 Swg. Electro-Galvanized G.I. 50 x 100 Frame attractively finished in epoxy powder coating. Anti-Vibration mounts - provided at 2 stage for double dampening effect. Mounted on shock absorbing special heavy duty Anti-Vibration mounts. 4 Nos. below the work top and 4 Nos. on foot of the table. Special Shore 'D' hardness Rubber used for the Anti Vibration Mounts. All AVT's / VIT's are tested with calibrated Vibration meter. Advanced Shock Resistant Air Spring Mounts. Advanced Auto Leveling Pneumatic Mounts.